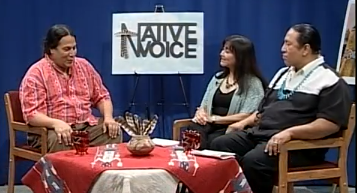 Cihuapilli Rose Amador and Sundust Martinez interviews Shana Wa Littlebow (Tigua) on Native Voice TV show. Littlebow gives his story of what inspired him to become a poet. Littlebow talks about his involvement in 1986 for the Global Disarmament and listening to John Trudell (Native American – poet, actor, activist) as his ‘Mentor’. Littlebow started to collect his phrases and naturally started making his poems. On Native Voice TV he recites over four or more poems and gives the story of what inspired him do write each one. One poem is called, “Wolf Cousin” and he was inspired to write this poem due to his experience of seeing wolves behind cages. This poem written over 21 years ago still is relevant in todays times. This is a must see and listen show.